Is one supplement better than another? We are regularly asked how Cooper Complete® nutritional supplements are different from other brands. The answer is all Cooper Complete products are scientifically based, pure, potent and proven. In the early 1990s, Dr. Cooper started studying the impact of exercise and supplementation on health. He had seen a report that 40 percent of the 2,300 runners in the 1987 Los Angeles Marathon had been ill with a cold or the flu during the two months preceding the race. Concerned excessive exercise might be part of the problem, Dr. Cooper researched the issues, which confirmed his concern. He found excessive amounts of exercise did not provide the health benefits moderate intensity exercise provided and that vitamins and supplements played an important role in supporting optimal health and athletic recovery. This research was the basis of Dr. Cooper’s 1994 book, The Antioxidant Revolution. Shortly after the publication of The Antioxidant Revolution, Dr. Cooper gathered together leading researchers from around the country, and with the physicians and registered dietitian nutritionists at Cooper Clinic, asked the team to formulate a multivitamin and mineral supplement that would deliver the appropriate amount of nutrients needed for optimal health. The result—Cooper Complete Original Iron Free. With all of Dr. Cooper’s work rooted deeply in research, Cooper Complete Original Iron Free quickly became the focus a double-blind, randomized clinical trial of almost 200 subjects followed over a six-month period by researchers at The Cooper Institute. The first of two manuscripts from the clinical trial, “Complex Multivitamin Supplementation Improves Homocysteine and Resistance to LDL-C Oxidation,” appeared in the Journal of the American College of Nutrition (October 1, 2003; Vol. 22, No. 5). Results indicated Cooper Complete Original Iron Free was highly absorbed. In addition, it lowered the oxidation rate of LDL cholesterol by 14.6 percent and homocysteine levels by 17.2 percent. This concrete, scientific evidence showing the multivitamin’s ingredients were absorbed by the body was vital—addressing the long-running question many people had as to whether multivitamins and supplements were truly absorbed into the body. A second manuscript, “Reduction of C-Reactive Protein Levels Through Use of a Multivitamin,” published in The American Journal of Medicine (Dec. 15, 2003; Volume 115, No. 9) showed Cooper Complete Original Iron Free had a positive impact on inflammation—reducing levels of C-reactive protein by 32 percent. This was exciting news too, as this marker of inflammation increases with age, unmanaged blood pressure, alcohol use, smoking, limited or no physical activity, and diabetes. Higher levels of C-reactive protein are connected with heart disease and diabetes. When our one-tablet-a-day multivitamin, Basic One, was introduced, we also studied it. In the study “Complimentary Effects of Multivitamin and Omega-3 Fatty Acids Supplementation on Indices of Cardiovascular Health in Individuals with Elevated Homocysteine,” published in the International Journal for Vitamin and Nutrition Research, 82 (1), 2012 (41-52), results showed that the subjects taking Basic One Iron Free and Advanced Omega-3 (two softgels daily), had a 13 percent reduction in C-reactive protein, a 17 percent reduction in homocysteine and a 23 percent reduction in triglycerides. 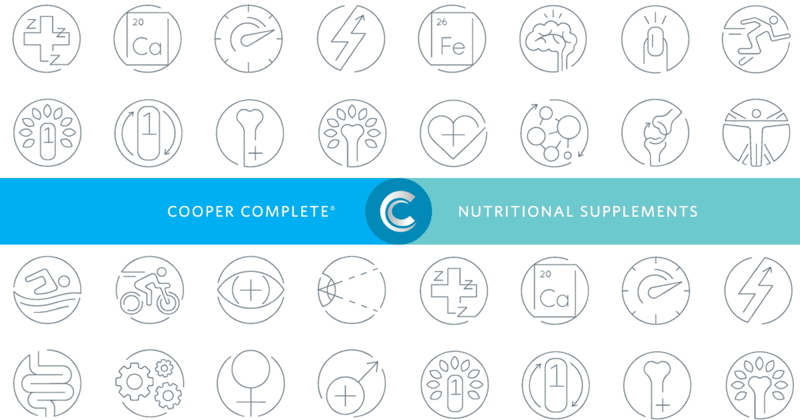 Now in our 17th year, the Cooper Complete line includes 20 products, and the goal remains the same—to offer products formulated to deliver the appropriate amount of nutrients for optimal health. Each ingredient and the level of the ingredient is carefully considered based upon the overall body of scientific research before its inclusion in any product. Once there, the pressure continues. Each product (and associated ingredients) is regularly reviewed by our team of physicians, researchers, and registered dietitian nutritionists, and adjusted as needed based upon the latest overall body of scientific research. An example of our review, the Cooper Complete Original formulation initially included 10 mcg (400 IU) vitamin D-3. As research on vitamin D has grown, it has been reviewed by our team and the Cooper Complete Original formulation has been adjusted multiple times—first to 20 mcg (800 IU), then 25 mcg (1,000 IU) and now 50 mcg (2,000 IU). Through Cooper Clinic testing of vitamin D levels in all patients, it has also been identified that 50 mcg (2,000 IU) vitamin D isn’t enough supplementation for a good portion of the population. In response, we developed a stand-alone vitamin D-3 product for individuals needing higher levels than 50 mcg (2000 IU) vitamin D.
From a purity standpoint, Cooper Complete products are made in America, using the finest pharmaceutical grade materials available and Good Manufacturing Practice (GMP). Raw materials are tested as they arrive at the manufacturing facility, and then again as part of the finished product, to ensure the product is pure and meets the specifications noted on the label. Article by: Jill Turner, President of Cooper Concepts. For more information, contact us at 888.393.2221.